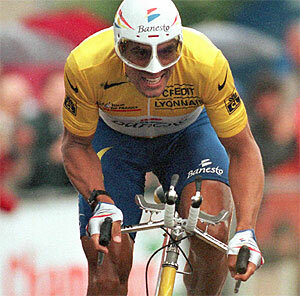 The Cycling Physiology of Miguel Indurain 14 years after Retirement. USP Araba Sport Clinic, Vitoria-Gasteiz, Basque Country, Spain. Age-related fitness declines in athletes can be due to both aging and detraining. Very little is known about the physiological and performance decline of professional cyclists after retirement from competition. To gain some insight into the aging and detraining process of elite cyclists, 5-time Tour de France winner and Olympic Champion Miguel Indurain performed a progressive cycle ergometer test to exhaustion 14 years after retirement from professional cycling (age 46 yrs; body mass 92.2 kg). His maximal values were: oxygen uptake 5.29 l.min-1 (57.4 ml.kg-1.min-1), aerobic power output 450 W (4.88 W.kg-1), heart rate 191 bpm, blood lactate 11.2 mM. Values at the individual lactate threshold (ILT): 4.28 l.min-1 (46.4 ml.kg-1.min-1), 329 W (3.57 W.kg-1), 159 bpm, 2.4 mM. Values at the 4 mM onset of blood lactate accumulation (OBLA): 4.68 l.min-1 (50.8 ml.kg-1.min-1), 369 W (4.00 W.kg-1), 170 bpm. Average cycling gross efficiency between 100 and 350 W was 20.1%, with a peak value of 22.3% at 350 W. Delta efficiency was 27.04%. Absolute maximal oxygen uptake and aerobic power output declined by 12.4 and 15.2% per decade, whereas power output at ILT and OBLA declined by 19.8 and 19.2%. Larger declines in maximal and submaximal values relative to body mass (19.4-26.1%) indicate that body composition changed more than aerobic characteristics. 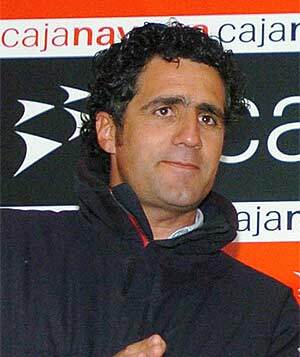 Nevertheless, Indurain’s absolute maximal and submaximal oxygen uptake and power output values still compare favorably with those exhibited by active professional cyclists. This entry was posted in Reviews and tagged Cycling Endurance exercise engineering Fatigue Profiling Heart Rate Monthly Testing Protocol Orthostatic Heart Rates Power sports and exercise engineering sports engineering Sports Exercise Engineerin, Indoor Cycling, Monthly Testing Protocol, sports and exercise engineering, Training, VO2 Max, Watts. Bookmark the permalink.